You might have come across the term Green Computing whenever reading through IT related literature or articles. Green computing or Green IT is the practice of designing disposable computer devices, software and applications that brings zero effect to the environment. The purpose behind the development of green computing is to reduce the use of perilous components of computers that damage the environment and optimize the energy. Many companies which are engaged in developing and designing electronic gadgets are trying to overcome this problem by focusing on green computing implementation. IBM is the leading company of today who took the initiative by incorporating green computing in its infrastructure very seriously. That means green computing is not the concept based on academics but it has wide industry application too. Every one of us is responsible to save our mother earth and make eco-friendly products in order to save our environment. 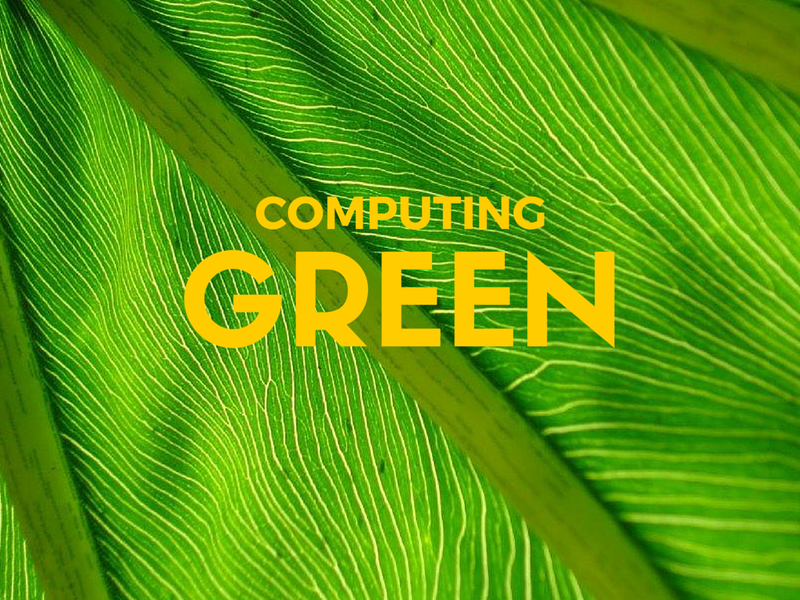 Not only the green computing, there are other concepts of green designing, green manufacturing and green disposal, associated with the concept of green computing. Talking of going green is easy but implication is very difficult except IT industry because there are applicable ways to protect earth from hazardous effects of technology. Green data center is another term which is relevant in this regard. As data centers hold large amount of data which consumes more energy than an office building, so they have to be energy efficient which requires environmental friendly use of products. You need to ensure that your datacenter works more and consume less power and this can only happen when you exactly measure the performance of datacenter that how efficiently it is working. Here are the factors of Green computing which will be discussed separately. We all are aware with the fact of thinning ozone layer because of global warming which has given birth to many pollution issues and untapped diseases spreading around the globe. So, the basic aim of knowing and understanding green computing is to firstly save our natural environment and its beauty. To save the globe from disastrous effects of computer devices, we need to recycle components and equipment. Most of the material in the devices is recyclable or can be used to make another product for example; CDs have gold, nickel, glass or any other material which is extracted and reused to make other device. Similarly, everything present in the battery is recyclable but all you need is to do more work to recycle ewaste. When your electronic product becomes unwanted or of no use, it turns into the eWaste. We find the best option to replace old gadget with the new one and the old one into the trash. Your electronic device is not just only the plastic material; it contains toxic elements which are harmful for the environment. It requires proper collection of electronic waste by the companies who make and sell electronic products. This practice will generate the market of companies to collect ewaste from trash and refurbish it in order to save environment. The advantages of green computing are not restricted to the recycling and appropriate disposal procedure; it has vast implication in order to save energy. Turn off and shut down is the easiest way to save energy but people overlook it and do not follow the basic way that is helpful in consumption of less energy. Reducing the brightness of monitor can also help in this regard. Putting screen saver to the monitor is not enough because they are not energy savers; you need to take care by yourself while using your electronic product. When there is less energy consumed by server, it automatically saves the cost. It needs less electricity and the organization will eventually see the decline in the amount of utility bills. That is the reason that organizations today implementing green technology to save their cost and making their products efficient in consuming less energy. It should be kept in the mind that only computer users are not responsible for protecting the environment, green designing is one of the job of designers who make design and framework of electronic products. Here are some approaches of implying green computing. Virtualization is the process of running two or more logical computers set over one set of physical hardware. Virtualization enables datacenter to consume less power by increasing the server’s utilization that makes the efficient use of assets. Monitors mostly use cold-cathode fluorescent bulb to reflect light on display, newer displays uses light emitting diodes that reduces the electricity consumption. Use of these types of displays can help in regard of green computing. Similarly, Use of efficient power supplies helps to reduce emission of greenhouse gases. Use of telecommuting in green technology has shown positive results such as with the help of telepresence and teleconferencing cost of traveling can be reduced by lessening the emission of carbon gases from environment. Electronic Product Environmental Assessment Tool is a method to evaluate the product and its impact on the environment.it has criteria to assess the product with reference to environment and grade the product as Gold, silver or Bronze. This is one of authentic way for the purchase to identify if the product is environmental friendly or not. Earth and its climate is the blessing of nature for us and it is the responsibility of all of us to protect it from emission of carbon footprints, greenhouse gases and toxic materials. Green computing is the contribution of IT industry for the protection of our environment. Each of us needs to be efficient in ewaste management to reduce, reuse and recycle the unwanted electronic products. Fiona Allen is writer at 5stardesigners for over 2 years and trained many writers who wishes to build their career in article writing too. 5stardesigners seeks to provide Custom website Design Service to both small and medium size businesses all over the world. Follow 5stardesigners on Twitter to know more about company.